What is the Real "Scoop" on Aspirin + Clopidogrel in Atrial Fibrillation? Article Reviewed: The ACTIVE Investigators. Effect of Clopidogrel Added to Aspirin in Patients with Atrial Fibrillation (ACTIVE-A). N Engl J Med. 2009 May 14;360(20):2066-78. Is the benefit of the combination really worth the risk? The bottom line is that the combination (compared to aspirin alone) reduced the composite endpoint of stroke, myocardial infarction, non-central nervous system systemic embolism, or death from vascular causes by an absolute difference of 0.8%/yr (meaning that one would need to treat 125 patients for a year to prevent one event). But balanced against that risk was an absolute increase in the risk of major bleeding of 0.7%/yr (meaning that one would need to treat 143 patients to cause one major bleed). Further, there was a trend toward more severe and fatal bleeding with the combination. Whether the decrease in events vs. the increase in major bleeding justifies use of this combination may be considered questionable by many. Is the combination really safer than a vitamin K antagonist (VKA), such as warfarin, in those at increased risk of bleeding? First we should acknowledge that fewer than 25% of the patients in this trial were considered unacceptable candidates for warfarin based on an increased risk of bleeding. Furthermore, available data now suggest that the risk of major bleeding with the combination antiplatelet regimen is certainly no lower than that seen with well-managed warfarin and may even be higher (though not statistically different) as discussed below. In the ACTIVE A, however, approximately 50% of patients were deemed inappropriate for warfarin based on the physician's judgment and approximately 25% simply preferred not to take a vitamin K antagonist. One can only wonder (1) how much the physician preference may have influenced the decision not to use a VKA in these patients and (2) how thoroughly the risks and benefits of warfarin may have been explained to the patients. Even so, the authors point to a meta-analysis of aspirin and warfarin use in atrial fibrillation patients to support the position that VKA therapy more than doubles the risk of intracranial hemorrhage (an absolute difference of 0.2% per year) and increases the risk of major extracranial hemorrhage by 70%.1 It should be noted that the meta-analysis included older atrial fibrillation trials, some of which used prothrombin time ratio (PTR), rather than INR for monitoring. In some of these trials, based on the sensitivity of the thromboplastin used in the participating laboratories, the target PTR actually corresponded to an INR above 4 and possibly above 5, well above the current recommendations.2 In INR based trials - and even a recent trial in elderly patients3 (clotcare.org/clotcare/warfarinvsaspirinforafib.aspx) - the risk of major bleeding and intracranial bleeding with well-managed warfarin has been shown to be comparable to that of aspirin. [Admittedly, this low bleeding rate with warfarin may not apply to patients with cerebrovascular disease who have a higher bleeding risk with warfarin.] Even in the ACTIVE W trial (a comparison of aspirin and clopidogrel vs. warfarin), the risk of major bleeding with warfarin (2.21 % per year) was actually lower - though not statistically different - than the bleeding risk with the combination (2.42 %/yr) [clotcare.org/clotcare/aspirinclopidogrelwarfarinafib.aspx]. In addition to well managed warfarin not having a higher major bleeding rate than aspirin, it is also prudent to remember that warfarin can be quickly and easily reversed with vitamin K but that both aspirin and clopidogrel are irreversible inhibitors of platelet function with no known reversible agent. patientselftestingforatrialfibrillation.aspx] and two recent trials have reported quite good INR control with minimal "hassle" by combining patient self-testing with modern computer-assisted management.4,5 I believe that we are on the verge of a revolution in VKA management that will lead to a substantial improvement in INR control that could make such therapy twice as effective as usual while reducing the usual bleeding rate by 50% or more and simultaneously making the therapy much easier to manage. [see clotcare.org/clotcare/improveinrcontrol.aspx] Such a change in VKA use would require reconsideration of VKA therapy in a wide variety of conditions and clinical settings. How does the efficacy of aspirin and clopidogrel compare to that of warfarin and just how effective is warfarin? The Active W trial demonstrated that warfarin is superior to the combination antiplatelet therapy, and the current ACTIVE A indicates that there is a trade-off with the combination being somewhat more effective than aspirin but at an increased rate of major bleeding. The previously cited meta analysis indicated that aspirin reduces the rate of stroke by about 22%. By contrast, warfarin is often cited as providing approximately a 65% reduction in stroke risk; but that is based on intention-to-treat analysis. An on-treatment analysis found a greater than 80% reduction in stroke.6,7 Further, post-hoc analysis of two recent A. Fib. trials found that the rate of stroke, MI, major bleeding, and death was reduced further if the percent of INR time in range was improved above 65%. 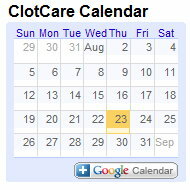 [see clotcare.org/clotcare/improveinrcontrol.aspx]. Therefore, one may conclude that aspirin may reduce the risk of stroke by approximately 22% while optimal warfarin management in adherent patients can reduce the risk of stroke by more than 80% while substantially reducing major hemorrhage, MI, and death over the rates seen with sub-optimal INR control. While there certainly are some patients with A. Fib who are not warfarin candidates, the substantial efficacy and potential safety of well-managed warfarin requires us to consider this therapy in almost all patients with A. Fib. And if new warfarin management techniques can increase the ease with which optimal INR control is achieved; the number of patients who can benefit from such therapy should increase as should the degree of benefit. Hart RG, Pearce LA, Aguilar MI. Meta-analysis: Antithrombotic Therapy to Prevent Stroke in Patients Who Have Nonvalvular Atrial Fibrillation Ann Intern Med 2007; 146:857-67. Bussey HI, Force RW, Bianco TM, Leonard AD. Reliance on prothrombin time ratios causes significant errors in anticoagulation therapy. Archives of Internal Medicine 1992; 152:278-282. Mant J., Hobbs FD, Fletcher K, et al. Warfarin versus aspirin for stroke prevention in an elderly community population with atrial fibrillation (the Birmingham Atrial Fibrillation Treatment of the Aged Study, BAFTA): a randomised controlled trial. Lancet 2007; 370:493-503. Ryan F, Byrne S, O'Shea S. Randomized controlled trial of supervised patient self-testing of warfarin therapy using an internet based expert system. Blood (ASH Annual Meeting Abstracts) 2008; 112:Abstract 879. Harper PL, Pollock D. Anticoagulant self-management using near patient testing and decision support software provided via an internet website improved anticoagulant control in patients on long-term warfarin. Blood (ASH Annual Meeting Abstracts) 2008; 112: Abstract 1278. Albers GW. Atrial Fibrillation and Stroke: Three New Studies, Three Remaining Questions. Arch Intern Med. 1994;154(13):1443-1448. Atrial Fibrillation Investigators. Risk Factors for Stroke and Efficacy of Antithrombotic Therapy in Atrial Fibrillation: Analysis of Pooled Data From Five Randomized Controlled Trials. Arch Intern Med. 1994;154(13):1449-1457.